It’s Sunday. It’s Jose Rizal’s 150th birthday. And as usual, I’ll give you a glimpse of the front page, a rundown of the current events, of what’s hot, and what’s not. I was suppose to buy a copy of today’s issue of PDI but the vendor told me that the copies here in Los Baños lack some parts. Especially the Sunday Inquirer Magazine. So I just decided to look for the digital copy. I already tweeted @inquirerdotnet and they promised me that they will do something about it. Palace stands firm on the issue about the Spratly Group of Islands. The BRP Raja Humabon, our country’s only warship, has already been deployed to guard the Scarborough Shoal. Yes kids, it’s true that we have warship. And no, it is not true that our most powerful floating vessel is Willie Revillame’s yacht. There’s a looming food crisis and the government secures agriculture for food-secure future. I hope that this (alleged) food crisis is not the same as the past administration when it was allegedly use to divert the attention of the people from the leader’s numerous scandals and controversies. And please burgis capitalists, stop converting agricultural lands to commercial/ real estate lands. Jose Rizal lives in Cesar Montano. The latter, just in case the younger generation does not know, portrayed our National Hero in one of the most awarded movies of all-time. Back in the day when movies shown at the MMFF have quality and substance. Thank you to those who read (and who shed a tear) my Father’s Day post. Just in case you miss that one, you can click this link. Happy Father’s day to the one who contributed the sperm cell on your zygote! If you want to relive the life of our National Hero, you can watch Jose Rizal (starring Cesar Montano) tonight on GMA News TV. I-cut kaya nila yung scene na may nanggagahasang Prayle? If you only remembered our National Hero just because today is his birthday, think again. It’s a long weekend. Spend your time wisely. Maligayang ika-150 kaarawan Gat Jose Rizal. Padayon! I was a failure. A total failure and an embarrassment. And then my Father wrote this “open letter” when I was in second year High School and have it posted on the Francois Corner – a bulletin board/literary board in the seminary for the written works of the seminarians (talk about “pambabraso”. Wink!). This letter changed my life. Since then, I have been writing articles after articles, taking into consideration his messages and advice written on this letter. This letter became a major turning point of my life. The Juan of today will never be the same had he not written this letter. Thank you Tatay. I will be forever grateful. I love you. 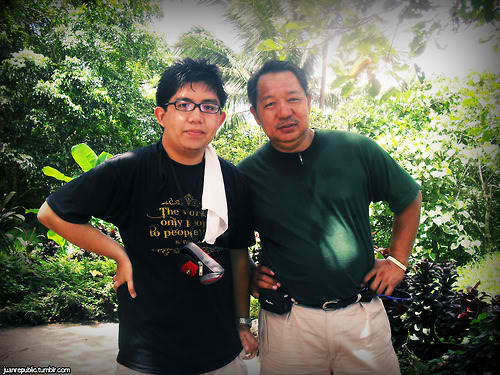 And thank you to my Tatay Juan who inspired me, who acted as my Maestro. My good friend and former roommate in College texted me this morning and asked me to see a copy of The Philippine Daily Inquirer. He told me that the headline has, sort of, a double-meaning. So instead of going to my favorite news stand, thanks to technology, I went to the website of PDI and looked for the digital edition of today’s broadsheet. At first glance, and if the reader is not discriminating enough, it may appear that the Church being referred to the headline is the Catholic Church (Haters gonna hate. Call it rash judgement but this country is dominantly Catholic.) 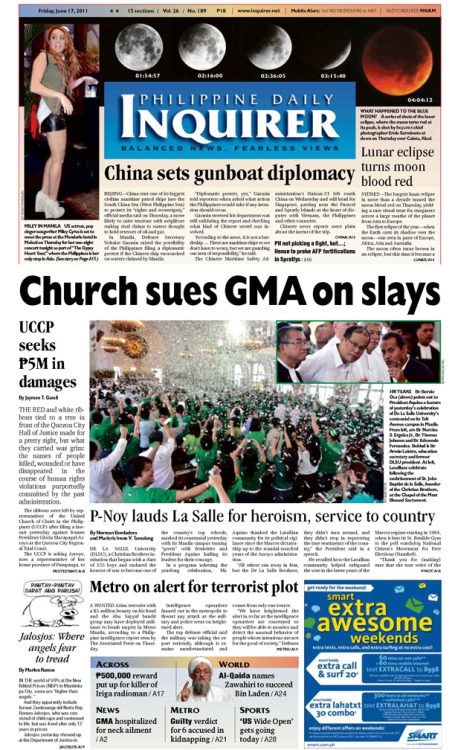 The church mentioned here is the United Church of Christ in the Philippines (UCCP), who, sues Congresswoman Gloria Arroyo in charge of the extra judicial killings of their members. So much for that. Let’s just leave the issue in court. Let the truth come out and the guilty be punished. If there is still justice in the Land of Juan. As usual, as what most of you my faithful readers knew, the Republic is giving you a dose of rundown of current events (with a little commentary and heckling on the side) and his passion for front pages and headlines of broadsheets, tabloids, and magazines. Total Lunar Eclipse – of the heart – Astronomy enthusiasts are fortunate to see one of the longest lunar eclipse of the decade – including me. I had my forever alone coffee party/ lamay on our house’s veranda to watch the bloody moon. And the clouds didn’t fail me. The sight was spectacular (and creepy). See you again lunar eclipse this December. Miley Cyrus in the house yo! – Miley Cyrus is here in the country for a concert at the Mall of Asia concert grounds tonight. I will not watch her concert but I added some of her songs on my playlist (You mad? This is not something new. I already added Taylor Swift and the Jonas Brothers before. Haha!). and, Ted Failon became a Philippine trending topic last night because he mispronounced Miley as “Mey-Lee” on TV Patrol. Okay. Congratulations De La Salle University and the La Salle Brothers for your one hundred years in the Philippines. I have a question though. Do you think Saint John Baptist De La Salle is also celebrating in heaven? Because if my memory serves me right, the Saint’s dream is to have a school for the impoverished. And it is obvious that that is not the case in the country. And..okay enough. Animo La Salle! Metro Manila is on heightened alert for terrorist plot. Let us be vigilant and be aware of our surroundings. Our beloved former Congreswoman Gloria Arroyo has been hospitalized for neck ailment. And according to news updates, she has already been discharged from the hospital but she will have to wear her neck brace for a week. Sayang ang new look. Get well soon Madam. President Aquino appointed executive secretary and his shooting buddy Paquito Ochoa as chair of the Presidential Anti-Organized Crime Commission. Akala ko si Mar Roxas na naman. Good luck Sir! Zawahiri was named by Al Qaida as successor to Osama Bin Laden. I give him 8 years before he’s captured/ killed by the United States forces. Does Coca-Cola still sell Coke 500? You know, the one mentioned in the Eraserheads song Tindahan ni Aling Nena. I remember buying Coke 500 ages ago together with pan de coco. Orgasmic merienda! Ah, life’s little joys. I expect heavy traffic on Sunday from Los Baños to Calamba and vice versa. Nah, not for the Rizal @ 150. i heard that Dingdong Dantes and the other Kapuso artists will be having a show at SM Calamba. Oh-key. Rebecca Black appeared to have gained weight on Katy Perry’s Last Friday Night music video. And yeah, she looks, uhm, prettier. I am excited for The Dawn’s Enveloped Ideas album. It is a tribute by different artists to The Dawn’s 25th anniversary. It contains covers of the hit songs by The Dawn much like 2005’s Ultraelectromagneticjam. Shameless promotion: Unlike before, I now rarely post here on Tumblr. I am more active on Twitter instead. If you enjoyed reading my posts, rants, and opinion, you can always talk to me there and be updated. Click here to follow my evil Twitter account. Let us all be vigilant and continue praying for peace. Stay safe. Tropical depressionEgay has entered the Philippine area of responsibility. Enjoy the long weekend. Maximize your time with your family and loved ones. God bless us all. Padayon! Most of us knew that the issue about the territorial dispute on the Spratly group of islands has once again ressurected and currently haunting thedaang matuwid administration of Mar Roxas and Jejomar Binay. Oops! My bad, It should have been Noynoy Aquino. It appears that the sleeping giant, China, is bullying us by (allegedly) sending their warships, patrol boats, and allegedly building their armadas on our territory. And we, a country inferior when it comes to military power, seem to just let these chinky-eyed bullies do whatever they want. Unbelievable? Go ask the President. Albay Governor Joey Salceda called for boycott of China-made products. As much as I understand the economic impact and great help to our local entrepreneurs of this move and the “Buy Filipino Only Drive”, I don’t think that this is possible. This will also paralyze the business of many Filipinos. Do you really want to see the impact of these China-made products? I am asking you to do this simple exercise. Go around inside your house and list down things with “Made in China” label. And compare them with “Made in the Philippines” and other non-China stuff. Pass it on a whole sheet of pad paper. Go! Just recently, South China Sea was renamed West Philippine Sea. I think this is more appropriate. And very timely. No to mining in Palawan! And in case of war against China on the West Philippine Sea, those miners should be the guards at Spratlys and the front liners in battle. Good luck mga Pare! The protesters above are very creative of making Kung Fu Panda’sPo as their protest posters. They should have also included Jet Li from the movie Hero and wrote “How swift thy ships!” (from the line in the movie “How swift thy sword!”). I still love China. They gave us Bruce Lee, Jet Li, and Jackie Chan. And my crush Zhang Ziyi. I hope this things will soon come to an end. Let us all be vigilant and continue praying for peace. Or let diplomacy and peaceful talks be the solution to end this problem. But for now, I must find a way to be reunited with Po. I still haven’t watchedKung Fu Panda 2. Is it better than the first movie? Ipagtanggol ang ating nasasakupan. Mabuhay ang Republika ng Pilipinas. Padayon! Photo and caption courtesy of the Philippine Daily Inquirer. Words by yours truly. Obviously. In celebration of the 113th Independence Day of the Philippines, the Republic is bringing back Juan’s obsession with front pages and covers of broadsheets, tabloids, and magazines. And here’s what caught my attention on the Church’s patio after attending the 6:00 AM Mass. At first, I thought that some prankster did this to the paper’s front page. But when I checked the other copies, I found out that this was not made by some bored individuals. This was The Philippine Inquirer‘s statement for press freedom in lieu with the 113th independence day. They further explained this catchy way of expressing their advocacy when I opened the broadsheet and saw the real front page. Freedom doesn’t come cheap. We have paid the price and we must continue to uphold it. Never stop daring. Never stop learning. Never stop trying. Never stop inquiring. What you see is what you get, which is not much, in a heavily censored Page 1 of Inquirer issue. Thank God for the freedom we now enjoy. We have paid the price with the blood of heroes and our daily strivings to defend it. Most of us who care knew that Philippines was once regarded as the most dangerous place for journalists. Kudos Philippine Daily Inquirer for your catchy way of showing your advocacy! Long live the freedom! Mabuhay ang mga mamahayag na Pilipino! Cultural Scholars say that GMA-7’s ‘Amaya’ is inaccurate andmisleading. Perhaps they want to follow the footsteps of Korean Networks who gave us Jumong and Jewl in the Palace. But please GMA Network, do not bastardize what was left on our glorious heritage. So what’s your next serye? Oh Spratlys! I can smell war on the Western Philippine Sea. Let us all be vigilant and continue praying for peace. We are celebratinf independence day but I believe that we are not really that free. Press people are killed and information are kept hidden. Support the Freedom of Information Act! Pass the Freedom of Information Bill. NOW! Tomorrow is the Feast of Saint Anthony of Padua, Patron Saint of missing things. It is also the fiesta in our Parish and Baranggay. Box office na naman ang Supermarket at Palengke dito sa eLBi. My class resumes this afternoon. It’s time to meet my new batch of students. Rakenrol. Kalayaan sa ating lahat. Mabuhay ang Republika ng Pilipinas! Padayon! Nagkakilala kami ni Eros Atalia noong nasa Kolehiyo ako. Yung roommate ko, bumili ng libro na may guwapong manong sa cover. Tapos, tawa na siya ng tawang mag-isa kahit dis-oras na ng gabi at nag-aaral ako ng mga kalokohan nina Nietzsche at Marx. Dahil senior ako sa kanya, wala siyang nagawa kundi ipahiram sa akin ang libro. Ang pamagat ng libro, Peksman (Mamatay Ka Man) Nagsisinungaling Ako (At iba pang mga Kuwentong Hindi Dapat Paniwalaan). Lumipas ang mga buwan, nagtapos ako sa Kolehiyo. Binalak ko noong seryosohin ang pagsusulat. Pero mahirap na karera iyon. Kaya humingi ako ng tulong kay Eros Atalia. Nag-email ako sa kanya ng mga sample kong blog posts. Sinabi kong isa siya sa mga inspirasyon ko. Mabait naman siya at nag-reply. Titingnan daw niya kung magagamit niya ang mga isinulat ko sa klase niya sa UST. Hindi ko na alam kung nagamit nga ni Sir Eros ang mga materyales ko. Pero katulad ng sinabi niya sa aking payo, hanggang ngayon ay patuloy pa din akong nagusulat, nangangarap, nag-aasam na isang araw ang mga gawa ko’y mailathala’t maging aklat. At friends pa din kami ni Sir Eros hanggang ngayon. Isang araw, habang nagliliwaliw ako sa Friends for Sale sa Facebook, nakita kong nagpalit ng profile picture si Sir Eros. At yun yung pangatlo niyang libro na Ligo na U. Lapit na Me. Dali-dali akong pumunta noon sa pinakamalapit na National Book Store para bumili ng kanyang obra. At muli, hindi na naman nasayang ang pera at panahon ko kay Sir Eros. Hindi niya binigo ang aking expectations katulad ng pagkabigo sa akin ni Kapitan Sino. Kahit medyo hindi pambata ang laman ng ikatlo niyang libro, suwak pa din sa aking panlasa. Ibang magkuwento si Sir Eros. Tila katabi ko lang sina Intoy at Jenn habang sila’y nagmo-MOMOX. Tila kasama ko sila sa kuwarto ng motel. At tila kasama kong sumuka sa loob ng bus si Intoy. Ay oo nga pala, sumuka din ako dati pero sa loob ng jeep na biyaheng UPLB. Hindi ko lang alam kung natatandaan pa ako ng mga kasabay ko noon. At kung may nasukahan ako. Pilit ko pa rin iyong ibinabaon sa limot. Lumipas ang mga panahon, medyo madami na din ang naisulat ko, dumami ang mga tagasubaybay ng blog, may iilang mga masugid na nagbabasa (mga less than 40), at patuloy pa ding nangangarap. Tapos isang araw, nakita ko sa cellphone ng kapatid ko ang isang poster ng pelikula na ginawa niyang wallpaper. Muntik na akong mapa-somersault sa tuwa (Ay de leche! Hindi pala ako marunong noon). Yung paborito kong libro ni Eros, gagawing pelikula na kasama sa Cinemalaya. Tapos ang gaganap pang Jenn, yung bago kong crush. Hindi si Julia Montes. Hindi pa siya puwede para sa role na ‘to. Si Mercedes Cabral. Ang sinasabing reyna ng Philippine Indie Films. Siya daw ang Babaeng Coco Martin. Langya sa title! Tapos kasama pa sina Mel Kimura, Simon Ibarra (Astig! Noli Me Tangere-inspired ang pangalan), Shalala, Beverly Salviejo, Joseph Bitangcol at marami pang iba. Excited na akong panoorin ‘to. Kaso, ang Cinemalaya, nasa Metro. Kaya good luck na lang sa akin sa pag-iskor ng tiket, pagnakaw ng libreng oras, at diskarte sa pamasahe at biyahe para mapanood ito. Kung hindi man, sana ay maglabas ng DVD. Yung orig ang bibilhin ko. Pramis. Nagbagong buhay na ako. Hindi ko ito-torrent ‘to. Maglalabas na ng pelikula base sa libro ni Eros Atalia, pero yung una niyang librong Taguan Pung, hindi ko pa rin mahagilap. Nagpunta na ako noon ng UST pero bigo akong maka-iskor ng kopya. Ikaw? Alam mo ba kung saan ako makakabili noon? At para sa kabatiran ng lahat, hindi ko naman isinusumpa si Bob Ong. Mahabang panahon din ang pinagsamahan namin. Sa katunayan nga, naging manunulat at direktor ako noong isinadula namin sa entablado ang libro niyangMcArthur. Ang punto ko lamang, mga kids, hindi lang siya ang Pilipinong may panulat. Maghalungkat kayo sa mga aklatan at bookstore para sa ilan pa nating mga kababayang may bayag sa pagsulat. At inaanyayahan ko kayong manood mamayang gabi ng Brigada sa GMA News TV channel 11, ika-8 ng gabi. Meron silang feature para sa mga Pinoy na manunulat. Kasama sina Eros at Bob. Masuwerte ang mga (naging) estudyante ni Sir Eros sa UST dahil meron silangfirst-hand experience sa taong hinahangaan ko. Pero para sa akin, sa pamamagitan ng kanyang mga libro, para na ring naging estudyante niya ako. At yun naman ang technique para magtagumpay sa buhay – ang maging estudyante, ang maging tagahanga, ang maging tagasunod at hindi ang pagsasabing “ganap at kumpleto na ako” dahil ika nga, learning is a lifelong process. Nuks. Cliche na cliche! Sana ay makita ko na sina Intoy at Jenn sa pinilakang tabing. At si Mercedes Cabral. Mabuhay ang obrang malaya! Mabuhay ang sining nating mga Pinoy. Padayon! It has been a tradition in the seminary to do a “mini-sermon” or sharing of reflection during the Holy Mass whenever one is celebrating his birthday. I never had my chance to deliver one since my birthday always fall on the day when seminarians are still on their summer vacation. So here am I, writing and sharing to you what I am suppose to deliver in front of the congregation. Join me in my reflection and thanksgiving as I celebrate my 22nd birthday. It’s an open secret to the people whom I met in the internet that I am a Seminarian, a Prayle-wannabe. And only a few handfuls knew my whole story. It has been more than 2 years since I left the Seminary to undergo an advised regency – or break – to fix myself in the real world. And supposedly, this year will be my return to pursue my 5-year theological studies before being ordained a deacon, and eventually, a Prayle (or a Damaso, depending on how you view my comrades). I chose not to return this year for personal reasons. And I still don’t know if I would still return in the seminary to pursue my vocation and dream of being a Priest. Let me share with you some of my reasons. Second, since I wasted my two years, I still lack the experience which will measure my growth into maturity and balance between Priesthood and a life of an ordinary bachelor. When I graduated last 2009, I promised myself that I will travel, meet new people and do things that I have been deprived of during my eight (8) years in the Seminary. I want to do”a million other things”. Third, during the past 2 years, I have done things which are not appropriate for a Prayle-wannabe like me. I hurt people. And I still haven’t fixed those broken relationships yet. I don’t want to return to the seminary with a heavy heart and a feeling of guilt. Fourth, I am still undecided with my vocation. Following the principle in ethics “in doubt, do not act”; I do not want to enter the seminary with a disposition of doubt. I think it will be unfair to God, to the Church, and to her people if I leave the Priesthood just because I pursue my theological studies without being sure of myself (Manangs and those who are forcing me to return immediately to the Seminary, I hope you can read this). Those are the four major reasons why I opted not to return to the Seminary this year. But as in all journey, life must go on. Today, I am celebrating my twenty second birthday. Some would say that I look older than my actual age. Some, especially bus conductors and jeepney barkers, would call me “Totoy”. But if you would ask me, I still feel that I am the same 19-year old young man who graduated in the Seminary more than two years ago. I’m just 37.4 pounds heavier (and yes, I know that it is not healthy). My life today is not much different from where I left. I am currently a Sunday School teacher in our Parish. Teaching catechism to children ages 12 and below gives me a sense of fulfillment. It is a noble apostolate. I also call it as a “defense Against the Dark Arts” post since teaching those kids prayers and Jesus Christ, his teachings of light and truth, is the best defense against the evil one. Despite all the bitterness, drama and tragedy, I am still thankful for the 2 years outside that the Prayles gave me to explore the real world. Though lack in experience and incomplete, I have learned to see life in a different perspective. I have learned to see the reality in the eyes of ordinary people – away from the comfort zones of the seminary. My life in the seminary is quite spoon fed. I have learned here in the real world to stand and to do things on my own. I am thankful to the people who became part of my journey for this past 2 years outside the Seminary. The nurses and staff of ASEAN RISK, Lipid Research Unit of Philippine General Hospital where I first worked. Technically. My comrades, my brother seminarians, my support group who continue to guide their prodigal brother. My Titas, Ates, and Kuyas in Sunday School who continue to inspire me to return to the seminary. To my former boss in the publishing company, thank you for the opportunity Sir Eugene. To the people whom I met here in David Karp’s cyber empire, most especially to the eLBikada – thank you for the laughters, tears, booze, smoke, and love. I would also like to thank the people who became part of my journey for 22 years.My parents, my family, and the Prayles (where I spent more than half of my life living with them). I would also like to ask for forgiveness to the people whom I hurt – consciously and unconsciously. I hope we can start a new beginning. This journey of 22 years has been fun. And I would like to start a new journey with hopes and dreams that this will also be a good one. Let’s aim for 90 years? Why not/ If the Japanese can do it, why can’t I? Thank you everyone for (wasting) spending your time reading this. I hope that you will also be part of my journey, Let’s walk together into the fullness of life. May God bless us all today, tomorrow, and forever. Padayon!